There are two parables in Luke 16, and in both of them Jesus speaks to the proper valuing of money and material resources. He puts things into proper perspective, and that makes them good texts for stewardship sermons. Stewardship is about more than paying bills. Stewardship is a reflection of our covenant relationship with God and with one another. The picture painted in the parable of Lazarus and the rich man is a bit clearer than the parable of the dishonest steward, but together they remind us about what it means to be a faithful disciple and about our responsibilities to each other. There are several verses separating the two parables that the creators of the lectionary chose to omit. That is probably because passages like this can lead to anti-Jewish ideas. In this case Jesus chastises the Pharisees for being lovers of money. If we can steer clear of caricaturing the Pharisees as self-righteous money grubbers, perhaps we can hear in the omitted verses a reminder that the love of money can corrupt us and keep us from loving one another. At Christmas time our family watches as many versions of the Christmas Carol as we can. In Dickens’ book and in the film and TV adaptations, we see a man consumed by money. As time goes on, he turns everyone around him into an object to be used and abused. Unlike the rich man in the parable, he doesn’t spend his money on himself, but neither does he reach out to those in need. Scrooge lives to fill his vault with gold, and as a result he leads a miserable life, and then he makes everyone around him miserable. There is another difference between the two stories. In the Christmas Carol Scrooge receives a visitation from Jacob Marley, his long-deceased business partner, warning him to change his ways so that he doesn’t fall prey to Marley’s fate. In many ways the Christmas Carol is a redemption story, but, I’m getting ahead of myself. The parable of Lazarus and the rich man is found only in Luke’s Gospel. In this parable Jesus introduces us to this man who wears purple clothing made of linen, which are in themselves signs of great wealth. Not only that, but every day he “feasted sumptuously.” I find that word “sumptuously” to be intriguing. I looked up its synonyms, which include words like opulent, lavish, and luxurious. This is no ordinary meal. There’s another related word to sumptuous, and that word is abundant. In life, the rich man enjoyed an abundance of wealth, which he spent on himself, without concern for anyone else. The other major character in this story is Lazarus, whose situation in life is very different. In this story, Lazarus lies at the rich man’s door, hoping to satisfy his hunger with the scraps that fell from the table. We also learn that he was covered with sores. He was sick and he was hungry, and to makes things worse the dogs came and licked his sores, further tormenting him. This isn’t a pretty picture, though it is similar to pictures in brochures and ads that invite us to give to charities serving the poorest of the poor. Little children with extended bellies. It tugs at our heart, but do we act, and if we act, do we do so wisely? Fortunately for us we can give through Week of Compassion, knowing that our gifts get to where they need to go. This is really a parable about a reversal of fortunes. Both men die at about the same time, but they go to opposite situations. Lazarus finds himself in the company of Abraham, the patron of hospitality. In death he finds abundance and healing. As for the rich man, well, he lands in Hades where he is tormented by eternal fire. The rich man looks at his situation and begins to pity himself. How did this happen? How did he land there, especially since Lazarus, whom he ignored in life, gets to hang out with Father Abraham. The rich man, still thinking only of himself, asks Abraham to send Lazarus to serve him. Couldn’t Lazarus bring some water to quench his thirst as he endured the torment of the fires of Hades. Unfortunately for the rich man, a chasm lay between the two realms. There would be no crossing over. Figuring there was no hope for himself, he asked Abraham to send Lazarus to warn his brothers about what awaits them. But again, Abraham refuses. Why would they listen to someone returning from the dead if they didn’t listen to Moses and the prophets. In other words, his brothers already had every thing they needed to do the right thing. The Torah and writings of the Prophets had already made it clear that God wanted God’s people to care for one another, especially those who are poor. In other words we don’t need a visit from Jacob Marley and the three Christmas Ghosts to do the right thing. You might be wondering where we fit in this parable. None of us is as poor and hungry as Lazarus, and none of us is as wealthy as the rich man. Even if we dress in purple linen clothing, these are no longer symbols of wealth. We might eat well, but I doubt any of us would think we are “feasting sumptuously.” Still, maybe the parable does apply to us! We may not be as poor as Lazarus or as wealthy as the rich man in the parable, but all of us have a share in God’s abundance. This leads to an important question. What is my responsibility for this abundance? 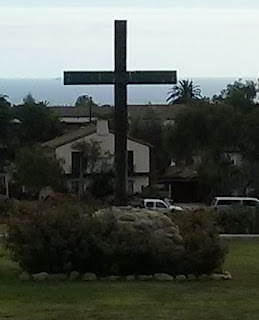 How might I share this abundance of God in a way that blesses my neighbor? We are not without opportunities to share our abundance with others. In a few weeks we will help host SOS. What I’ve noticed about those who come to the churches for shelter, is that many of them have jobs. What they can’t afford is a place to live, at least for now. We are participants with Rippling Hope in the Gospel in Action Detroit project, which offers us the opportunity to share life with residents of Detroit. Most of the residents we serve in Detroit are not poor in the same way as Lazarus, but many cannot care for their property as they would like. So we come and partner with them by fixing and painting their porches or fixing gutters. Sometimes we clean up vacant lots and board up buildings that pose dangers to the community. Through Week of Compassion we help provide water and filters in Flint and support for flood victims in Baton Rouge. In some cases what is needed is financial support. In other cases it’s physical labor. But in either case, it is an act of stewardship. I need to take note of another way in which we can extend our stewardship. That is the Reconciliation Offering, which we’re taking today and next Sunday. This offering helps fund the Disciples anti-racism efforts. 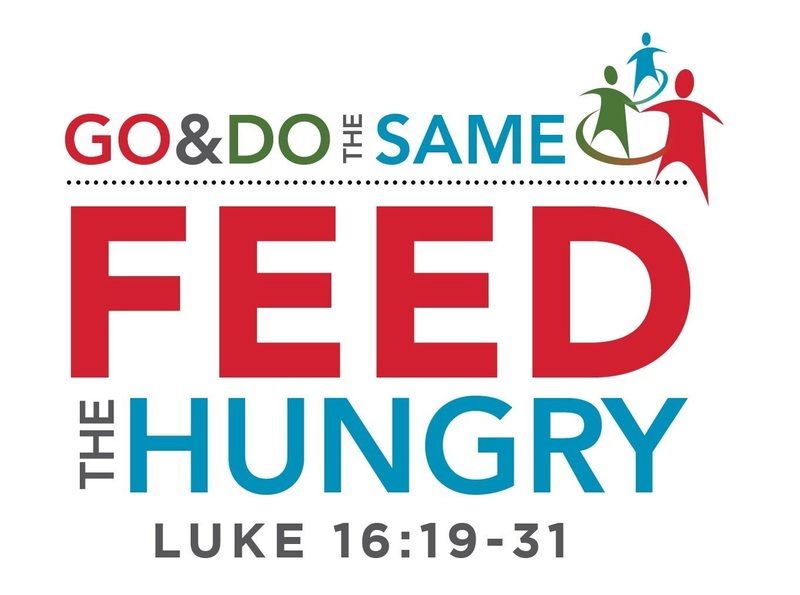 The stewardship theme for this year is “Go and Do the Same.” These are the words Jesus offers to the man who asks about the identity of his neighbor. This is a question that leads to the parable of the Good Samaritan. What Jesus’ questioner learns is that it is the one who shows mercy who is the neighbor. Then Jesus says: "Go and Do the Same." 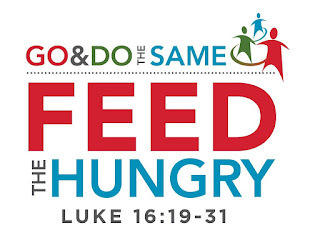 The word for us today, as signaled by the sermon title, which was provided by the Center for Faith and Giving, is that we can be that good neighbor by feeding the hungry. Since we are focusing our attention over the next several months on connecting our missional calling to the Lord’s Table, which we believe is open to all, this parable may speak to this emphasis. The Lord’s Table is very different from that of the rich man, precisely because Jesus invites Lazarus to dine with him. Jesus, in his compassion, says that the hurt of those who are hungry and poor and taxed beyond their means is to be taken seriously. It is not normal for people to be without food; it is not normal for someone who is blind or deaf to beg on the street (The Sacred Meal, pp. 20-21). When we gather at the Table we bring our offerings, some of which go to caring for the hungry. They are expressions of our covenant commitment to care for one another and for our community. Then, as we receive from that Table signs of God’s presence, we are stitched together as one people, committed to the common good of all, especially the hungry. Go and Do the Same!